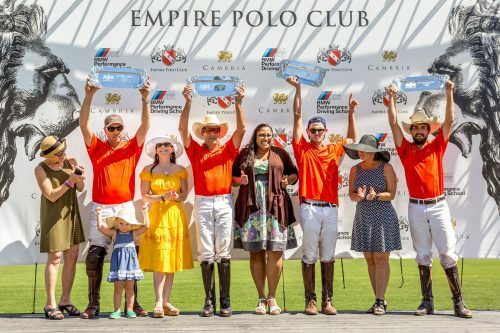 On Sunday, Empire Polo Club features two competitive polo games at 12:00 PM and 2:00 PM. Gates open at 10:00 AM for tailgating. 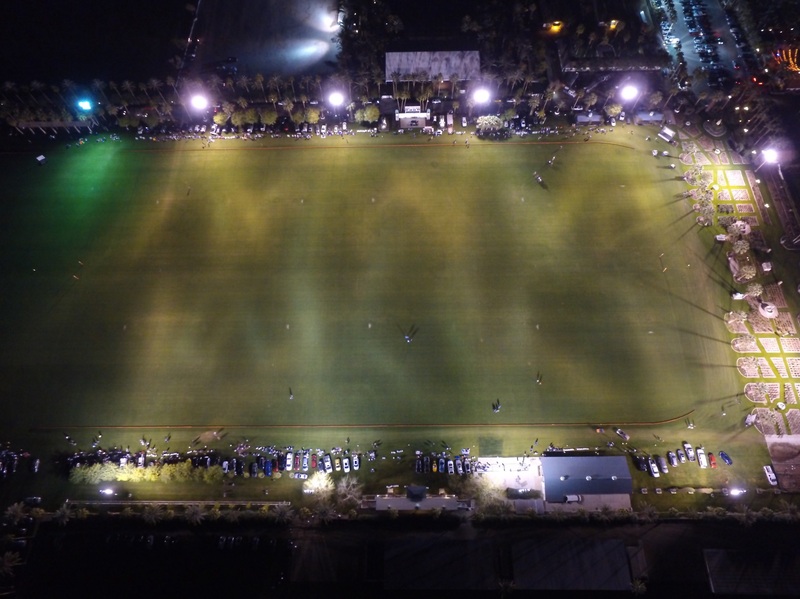 Empire Polo Club offers Friday night “Polo Under The Lights” on the third Friday of each month. 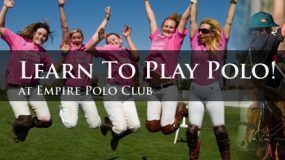 Friday night polo features one polo match that typically lasts about an hour and a half. Arrive early to get a good spot to tailgate. Bleacher seating is also available. Beverage service is available onsite during the Friday night games. Admission, tailgating and parking are free for Friday night games. Spectators are welcome to bring their own food and beverages to this event. 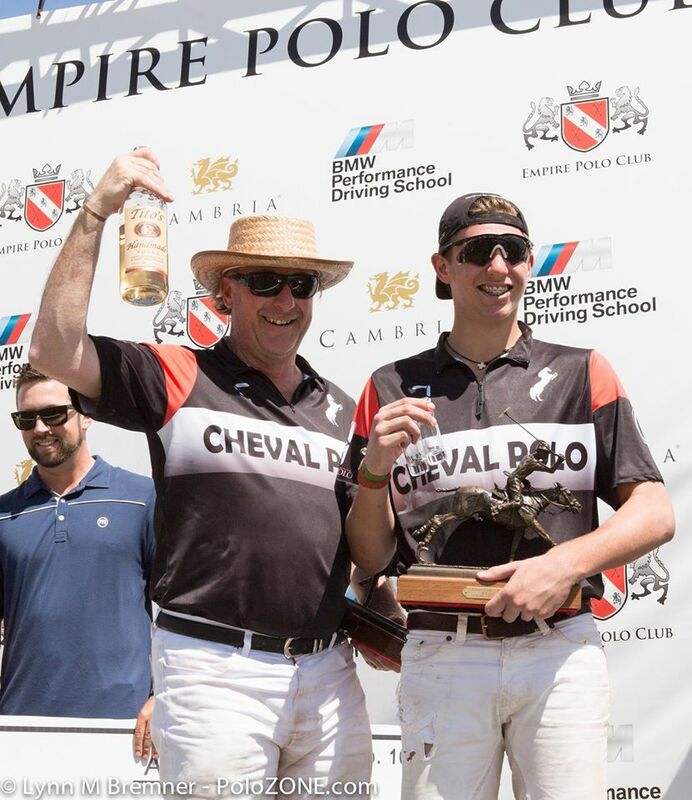 Enter on Ave. 50 for Friday Night Polo. School is OUT and Summer polo is IN! 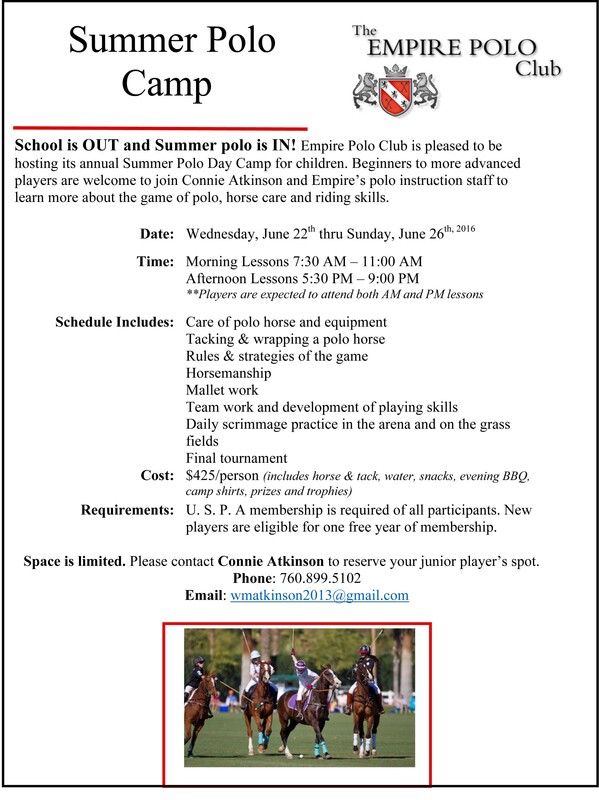 Empire Polo Club is pleased to be hosting its annual Summer Polo Day Camp for children. Beginners to more advanced players are welcome to join Connie Atkinson and Empire’s polo instruction staff to learn more about the game of polo, horse care and riding skills. Requirements: U. S. P. A membership is required of all participants. New players are eligible for one free year of membership. Click here to view the flier in PDF. Lockton took home the title and most of the cash in the USPA 8-goal Champions Cup final at Empire Polo Club in Indio, California on April 3. Lockton Polo Team won the USPA 6-8 Goal Champions Cup and $30,000. From left to right: Max Menini, Tim Kelly, Bryan Middleton and Jessica Bailey. Each of four teams put up $5,000, which was matched by the club for a total purse of $40,000. First place took home $30,000, while the runners-up took home $10,000. 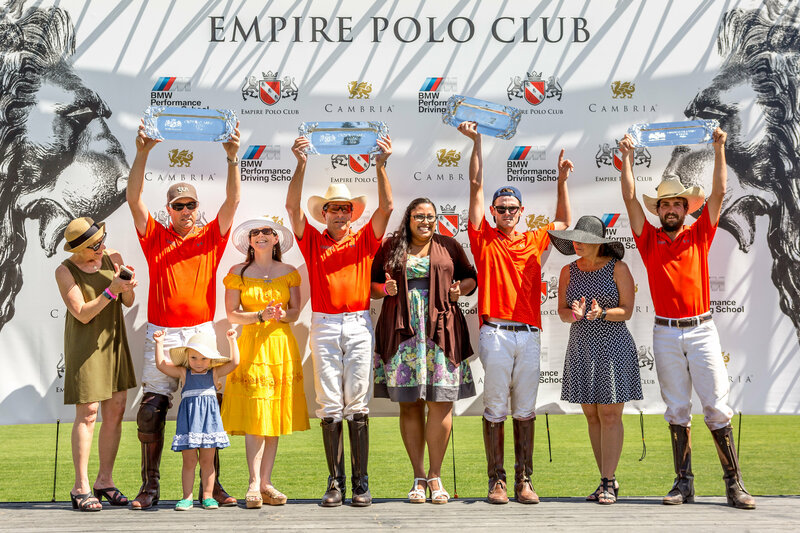 In the final match, Lockton’s Jessica Bailey, Bryan Middleton, Max Menini and Tim Kelly faced Lauburu Polo’s Eduardo Perez, Francisco Guinazu, Rodrigo Salinas and Doug Blumenthal. 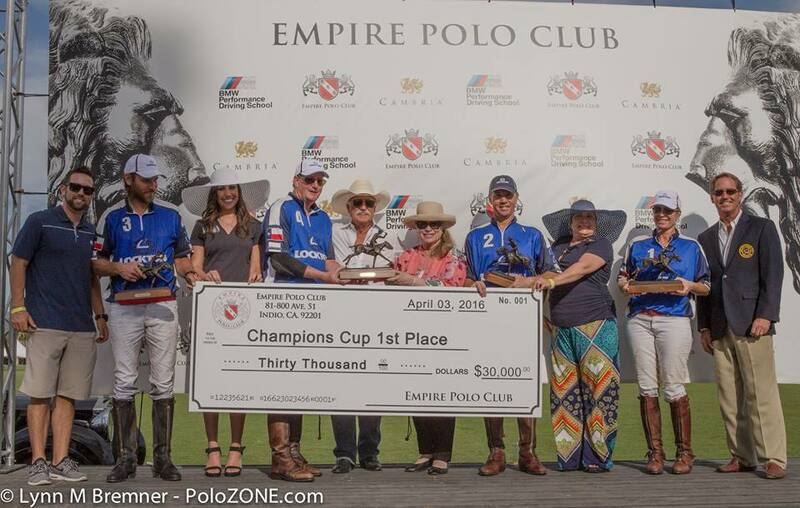 Lauburu Polo Team won 2nd Place and $10,000 in the USPA 6-8 Goal Champions Cup. From left to right: Doug Blumenthal, Rodrigo Salinas, Francisco Guinazu and Eduardo Perez. It was evident from the get-go that both teams were seeing dollar signs. Three-goal Middleton put Lockton on the scoreboard first with a drive down field, but 4-goal Guinazu responded with a successful drive of his own. The teams battled back and forth until the umpires’ whistles stopped the action. Lockton was awarded a Penalty 2, which Menini easily converted. 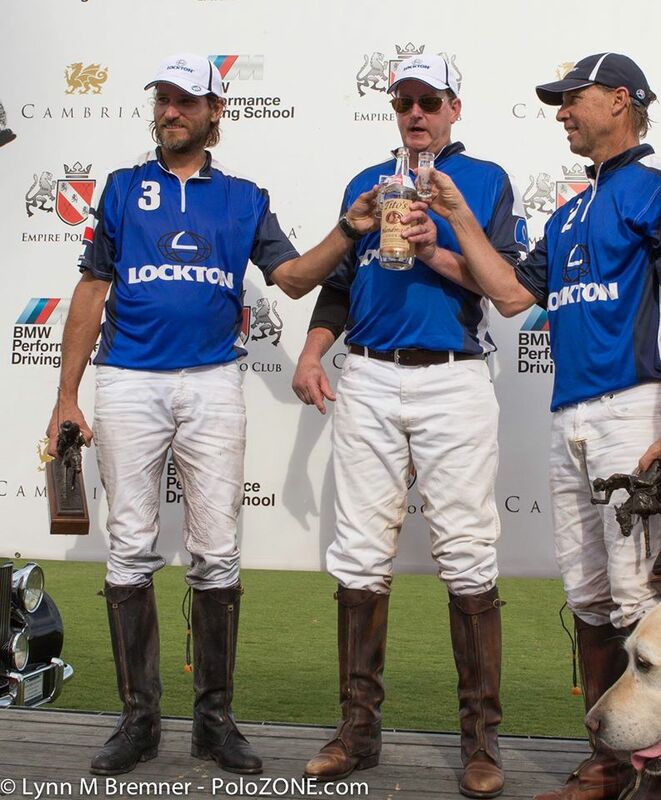 Later in the chukker, Lockton was whistled on a play and Guinazu sunk a 60-yard Penalty 4 to knot the score at 2-all. The second chukker mostly belonged to Lauburu Polo as Guinazu found the mark on another Penalty 4 and Salinas scored from the field. Menini split the uprights for Lockton, but Blumenthal answered for Lauburu Polo, keeping it ahead 5-3 after two chukkers. Neither team could find the mark in the third until Blumenthal sunk a Penalty 2, increasing Lauburu’s lead to three at the half. 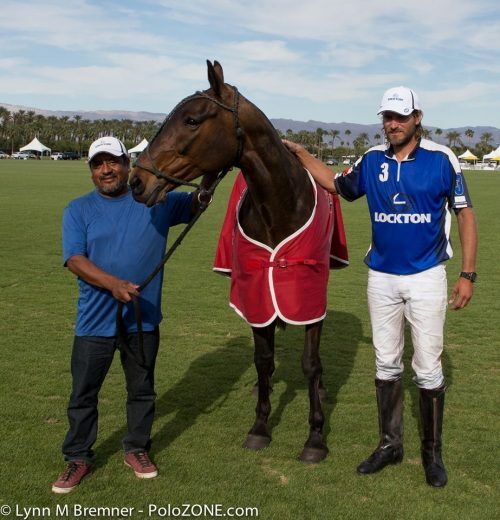 Max Manini’s mare “ Tita” won Best Playing Pony in the USPA 6-8 Goal Champions Cup. 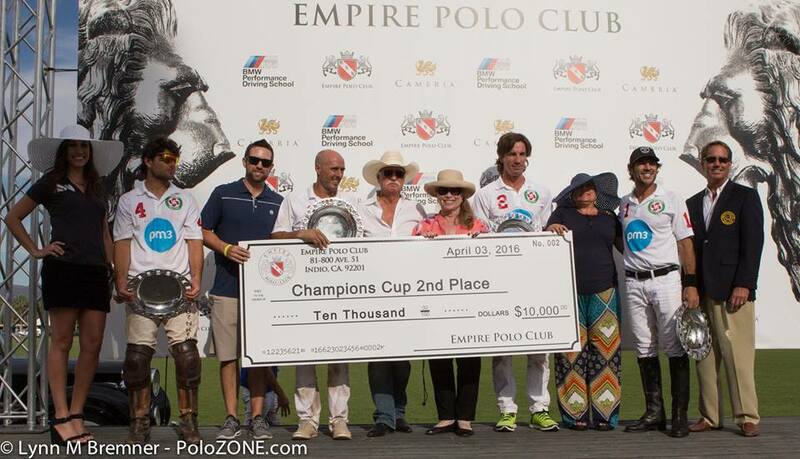 Max Menini was awarded MVP in the USPA 6-8 Goal Champions Cup. A Menini-Middleton one-two punch cut Lockton’s deficit to just one in the fourth, while Lauburu was silent. Blumenthal put Lauburu back up by two early in the fifth, but Menini went on a scoring rampage, sinking two open-goal penalties and a field goal, to which Tim Kelly added a goal to put Lockton in the driver’s seat, 9-7. Lauburu fought back, shutting down any Lockton drives to goal while Guinazu sunk his third 60-yard penalty and a field goal to tie the score at 9-all in the waning minutes of the sixth, and forcing overtime. In sudden death, the teams struggled to reach the goal with Lockton miss-firing twice and Lauburu once. Finally, with time ticking away, Menini found the mark to give Lockton the win. Menini was high scorer with seven goals, three from the penalty line. He was named MVP for his efforts, and his pretty bay mare Tita was honored as Best Playing Pony. 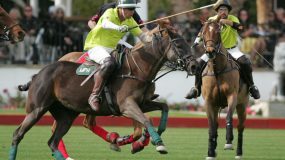 Guinazu led Lauburu Polo with five goals. 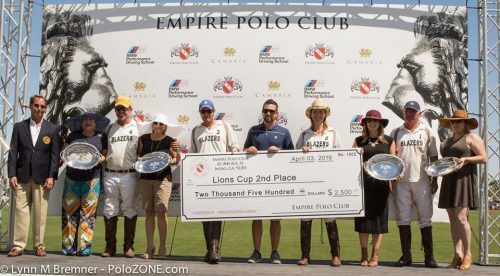 Will Rogers/Casa Sombras edged Blazers 10-9 in overtime to win the USPA 4-goal Lion’s Cup at Empire Polo Club in Indio, California on April 3. Will Rogers/Casa Sombras won the USPA 4-Goal Lions Cup Finals and $7500. From left to right: Diego Cossio, Bayne Bossom, Bolko Kissling, Conrad Kissling. Five teams each contributed $1,000, which was matched by the club, to create a $10,000 purse. The winners took home $7,500 while the runners-up took home $2,500. Blazers won 2nd Place in the USPA 4-Goal Lions Cup Finals and $2500. From left to right: Mondo Gonzalez, Kyle Fargey, Malia McCoy and Pat Powell. After a week of playoff games, Will Rogers/Casa Sombras’ Bayne Bossom, Bolko Kissling, Conrad Kissling and Diego Cossio took on the Blazers’ Malia McCoy, Pat Powell, Kyle Fargey and Mondo Gonzalez. 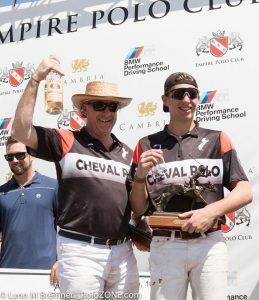 The teams got off to a slow start with Conrad Kissling’s Penalty 3 conversion the only goal scored in the first chukker. Three-goal Fargey came alive in the second with two quick goals, but Conrad and Bolko Kissling each answered with goals. Cossio split the uprights for Will Rogers, but Fargey responded to keep it close. A Penalty 2 conversion by Conrad Kissling and a field goal by Cossio put Will Rogers/Casa Sombras up 6-3 in the opening minutes of the third, before Blazers fired back with field goals by McCoy and Fargey. A Penalty 1 awarded to Blazers evened the score at 6-all. 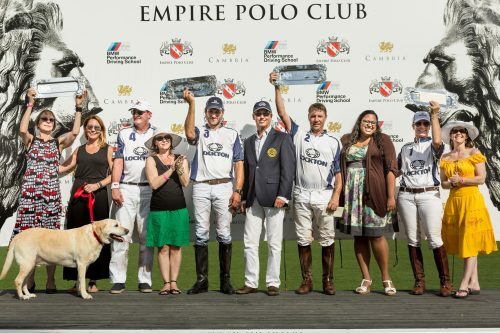 Conrad Kissling won MVP of the USPA 4-Goal Lions Cup. Back out on the field for the fourth, Conrad Kissling took the lead back on a perfectly executed Penalty 4, but Fargey had the answer with a Penalty 2 conversion. Cossio got in the last word to put Will Rogers/Casa Sombras ahead 8-7 going into the fifth chukker. It was a defensive battle until Fargey slipped free and scored back-to-back goals to put Blazers ahead 9-8. Regulation time was nearly out when Bossom fired to goal sending the ball across the goal line. As time ticked away, neither team was able to finish it off and the game was sent in to sudden death overtime. 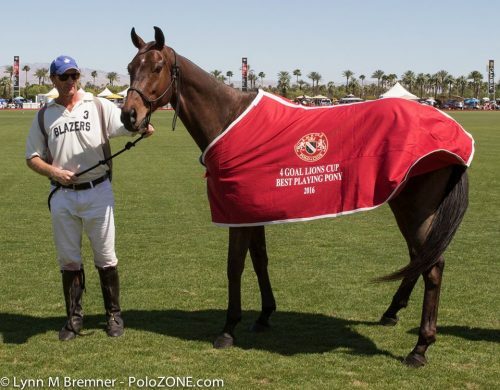 Kyle Fargey’s mare “Macarena” won Best Playing Pony in the USPA 4-Goal Lions Cup. As the overtime chukker got underway, both teams were hoping for the big payout. As the players scrambled for possession, a Blazers player caught the umpires’ whistle. Will Rogers/Casa Sombras was awarded a free hit from the 40-yard line. 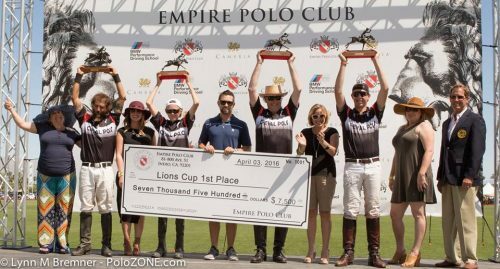 Conrad Kissling didn’t disappoint as he fired in his fourth penalty conversion of the afternoon to take the title, and the lion’s share of the cash. Not surprisingly, Conrad Kissling was named MVP of the match. Kyle Fargey’s pretty bay mare Macarena danced home with the Best Playing Pony blanket. Click here to view all photos from these two finals. Lockton defeated Roseville Motorcars to take home the silver for the 6-8 Goal Medjhool Challenge. Score by the chukker: 1-2, 3-2, 3-4, 6-6, 7-8, 9-8. Lockton: Tim Kelly, Max Menini, Bryan Middleton and Jessica Bailey. Evergreen defeated Blazers 7.5 – 7 to win the 4-Goal Crown Classic final at Empire Polo Club. Score by the chukker: 2.5 – 0, 4.5-1, 5.5-3, 7.5-7. Evergreen: Bryan Middleton, Tom Sprung, Juan Jo Gonzalez and Noah Sprung.